- The NW corner of the North British Hotel (now the Balmoral Hotel) with a Policeman on point duty in front of the hotel. - The Scott Monument, with a streamlined tram in front of the monument. - Woolworths, with the statue to the Duke of Wellington, facing up the North Bridge, in front of it. - Register House, with steps in front of it. I don't know the publisher of this post card. I have only seen the front of the card. Looking at the back of this card might reveal who the publisher was and /or when the card is likely to have been published. The streamlined tram, and what can be seen of the other vehicles, suggests to me that this photo might have been taken some time around 1950. Here is another photo taken from about the same position, but the open-top tram and the fashions suggest that this one would have been taken a few decades earlier. 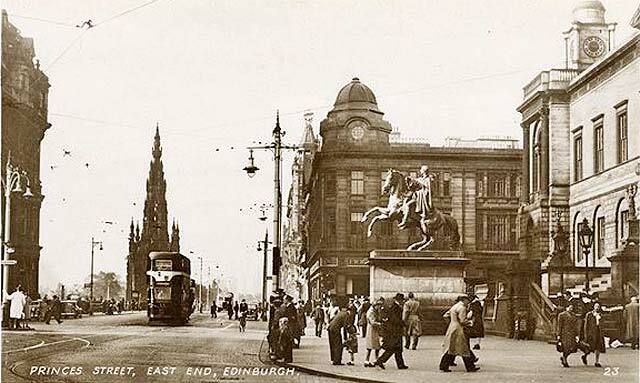 There is also an earlier style of lamp post in Princes Street, in front of Register House, in this photo. Please click here to read more about Edinburgh street lamps.